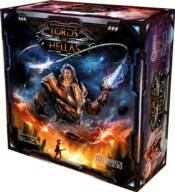 Lords of Hellas is a fresh miniature territory control game with adventure elements for 1-4 players from creators of This War of Mine: The Board Game and The Edge: Downfall. The game is set in the Dark Age of Greece, an era shrouded in mystery. This unique setting, combining classical Greek mythology with Sci-Fi elements, creates an amazing aesthetic with miniatures, great art and other components.